This Mid Century Modern Reproduction of designer Edward Wormley classic features a Bi-Sectional format. 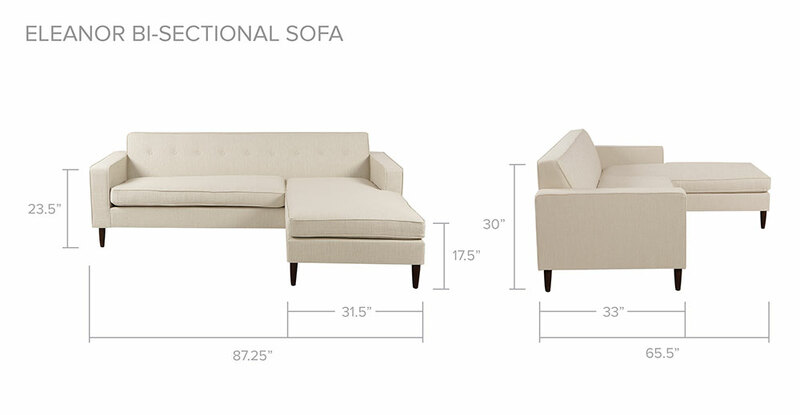 Use the Eleanor Bi-sectional sofa as either right facing sectional depending on your design needs at the time. Simply flip the cushions over and move the chaise unit to either the right or left facing without compromising the clean appearance of a full chaise seat. You will note by the images that the back of the sofa is one full width size. This means no unsightly separation running down the back of the sofa. The chaise seat cushion is one full piece from front edge to the back cushion so no seam from the sofa to the chaise element either. The cushions are upholstered on both sides and are flipped over to fit seamlessly as the independent chaise unit moves to either the left or right hand side. The chaise seat cushion is one full piece upholstered on both side allowing for the cushion to be flipped to fit the arm notch on both the right and left side. This provides for a well tailored appearance and versatility in room layout now and in the future. Heavy, down feather stuffed cushions you can sink into. Cushions that are upholstered on both sides so you can flip them over for versatility in the left or right hand sectional direction and increased longevity. The Eleanor bi-sectional is built by hand using a kiln dried solid hardwood frame. Built to last using a Metal S Sinuous no sag coil seat suspension system for the seat platform. Practical comfort and solid craftsmanship meet original mid-century modern aesthetics. With Eleanor, comfortable modernism is so easy to love. From the wood frame, to the down feather stuffed cushions to the stitching of the upholstery, the Eleanor Bi-sectional is crafted entirely by hand. A richly comfortable seating experience results. A fairly rare experience from a streamlined mid century modern seat cushion design. For ease of maintenance, button tufting is not present on the seat cushion. A single row of button tufting graces the back. 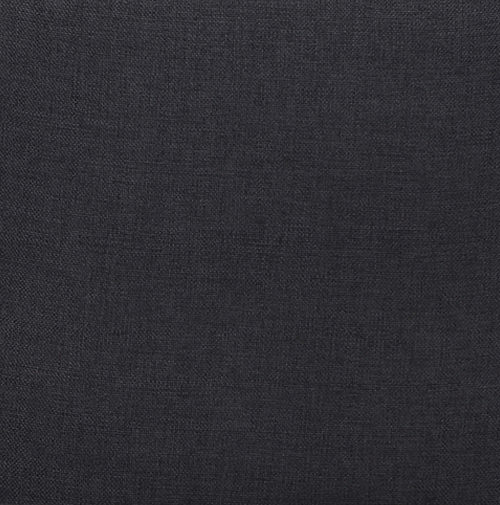 A gently cushioned frame and matching piping at the seams accentuate the minimalist lines. The wooden aspect of the legs creates a sense of grounding. The stiletto design of the legs lifts Eleanor from the floor providing the spacious midcentury modern feel. Entire Sectional; Full Width (side to side) 87.25"; Longest Depth (front to back) 65.5"; Height 30"; Inside Seat Width 76"
Sofa module: full width (side to side) 87.25"; depth (front to back) 33"; inside width 49.5", inside depth 22"
Chaise module: seat width 33", seat depth 54.5"; Ottoman base 31.5" x 31.5" x 12.25"
Floor to seat height 17.5"; Floor to arm height 23.5"